I’ve never seen a couple look more in love with each other — she’d bat her eyes, he’d smile. This continued from the day I met them to their wedding day. From start to end, their wedding epitomizes WHY I love doing weddings. There’s such a beauty found in a couple’s story! Even with the pending threat of rain and the potential of not being able to walk down the grand staircase (the Bride’s main wish), this couple continued to smile and relax in the knowledge that this was their wedding day and they were going to enjoy it. But the heavens smiled down on them and only a couple of hours before their arrival, did we get the “okay” to proceed forward with their outdoor princess wedding. The reception rocked! Great music, terrific food and a bridal party that just danced the night away. We had sparklies everywhere — this was definitely a “light up the night” party. From the Guest Seating Chart that was bedazzled in rhinestones to the shining cupcake stand to the fantastic 10 carat sized wine stopper favors, this reception glowed! 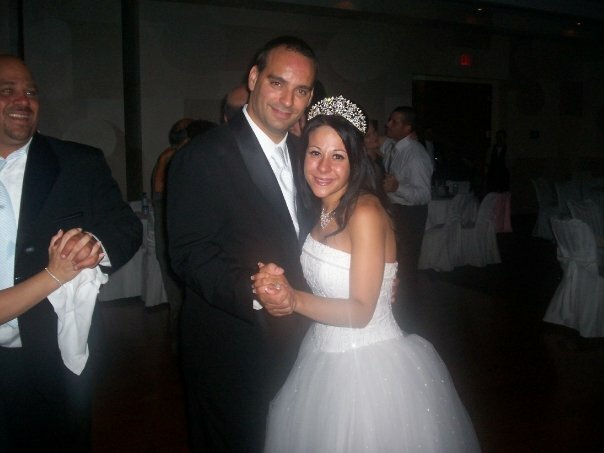 But nothing topped how beautiful Nancy looked — with an amazing tiara and a gorgeous tulle princess dress. 1. The speech made by the maid of honor, Val. What a beautiful testimony to their growing friendship! 2. Seeing Nancy and Pietro dance with Pietro’s son. 3. The thank you speech made from Sophia, the flower girl. 4. The long and strong hug between Bride and Mother of Bride. 5. Moments before Nancy’s entrance, the groom with his eyes closed, head raised to the warmth of the sun and just taking it in. 1. The night before, realizing the candles were too big for the candle holders and having to “shave” them down. Yes, shave. With a potato peeler. All 20 of them! 2. A week before, having the bride and myself covered in glitter, trying to sparkle the guest seating chart. And this was on top of having fingers stuck together by KrazyGlue and finding rhinestones in new places! 3. At the reception, the slideshow that didn’t want to show. But how wonderful was the staff at White Oaks to run “marathons” back and forth between the AV room and the reception to fix the problem. 4. Groom, “warming up” in prep to get the garter. Song of choice, Rocky theme, of course. And the funniest moment, in my opinion, for I couldn’t have even *planned* this one…. 5. Bride, during her speech: “I love my husband’s hairy body”. Congratulations again to Pietro & Nancy Rosati. I wish you guys a fabulous marriage, embraced with many blessings!